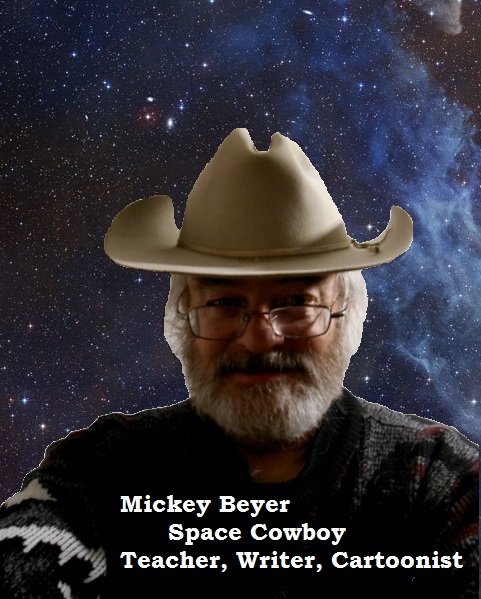 Michael Beyer is a former high school and middle school English teacher and author of the novels Aeroquest, Catch a Falling Star, Magical Miss Morgan, and Snow Babies. He was born and raised in Iowa and now lives in Carrollton, Texas with his family. After 31 years as a classroom teacher, he retired in May of 2014. 3. Mickey also talks about himself in the third person, a type of mental condition we don’t really have a name for yet. Further study of the issue is required. 4. Mickey also spent time working as an ESL teacher (English as a Second Language) at Naaman Forest High School in Garland, Texas. So now he is misunderstood in at least seven different languages. I used to live in Carrollton in 1984! I lived in Dallas for 10 years. Thank you for checking out my site. I hope you found something you enjoyed. Any advice on teaching? U.S. teachers are underpaid. The reason I know this? One part of my career life, I was the Financial person in a few school districts – so I saw salary comparisons all the time. This fact actually bothers me! My mother, also a teacher, would have concurred wholeheartedly, Michael. And we used to laugh over the fact that she mostly remembered the naughty students. HI Michael, Thank you for following my photography blog. I hope you are inspired. Interesting blog- I look forward to reading more. Thanks for your visit and choice to follow my blog today. I am enjoying my time here reading your posts and want to express my support and thanks to all teachers! Thanks so much for the blog follow. It led me to your fun blog, which I am now following. I look forward to reading more of your interesting posts! Oh, yes, I’d wanted to thank you for stopping in on my thing about Pearls Before Swine and offering opinions about it. I’m grateful for the thoughts. It’s great to meet you – especially this wonderful time of year. Hi Michael .Thank you for wanting to follow my poetry adventures.best Wishes. The Foureyed Poet. Thank you for following my blog! I understand you are a fellow teacher – I’ll be back to stroll your paths when our National Tests are over…See you, and thanks again! Much appreciated. Too fast clicking there…I find this a peculiar coincidence – my son has just finished creating a game for( PC) called Falling Stars! So my first thought was that this was a joke! I guess I’m not in on the joke. My novel Catch a Falling Star is not even the only novel by that name. There are at least two others. I named it after the John Donne poem, “Go and Catch a Falling Star”. HI, nice to meet you and thanks for stopping by on my travel blog. Hope to be here every time will allow me. Congrats for your nice family and best regards. Definitely deserved! All the best. Hi Michael, thank you for visiting and following my blog. I am a bit of Mickey fan, grew up watching the cartoons 😀 I look forward to reading your posts. Thanks visit my blog. I was high school history teacher here in Miami 33 years. Wow, thirty-three! I reached thirty-one this year and must now retire or drop dead of stress in front of the whole class. I love teaching, but the “what death by stress looks like” lesson is not one I want to teach. I hope you have as many wonderful memories as I do. GOOD FOR YOU!!!!! One of the biggest influences on my life was a high school teacher of mine. Love your title. Good to know you are a teacher. I too am a teacher and this is my favorite quote by Lily Tomlin ~ “I like a teacher who gives you something to take home to think about besides homework”. Thank you too for visiting mine. Howdy from Texas. Nice to meet you too. Thank you for the award and recognition. I will pass it on and reciprocate. I appreciate bloggers working together to build something wonderful. Thank you for the follow. Looking at your blog, I look forward to seeing more of your work! I love your post and share your love for the writers I find here on WordPress. I don’t know how many times I have been rescued from the “Blues” or the “Downs” or the “Bitter Clowns of Depression” by something I read in the comments or on a blog post. May Love and Life and Laughter find you always. I’m tickled pink to see that you have decided to subscribe to Learning from Dogs. Thank you so much. If you ever want to guest post over on LfD, that would be perfect. Happy New Year to you. Wow! Thanks! I love the idea of learning life lessons from dogs. My own dog read your post and loved it too. Yes, and thank you for following my blog too. I should warn you though… My blog is pretty goofy and I am told there is a danger that reading it too often could cause flowers to spontaneously sprout in your sock drawer. I haven’t figured out the physics of that yet, but it’s what they tell me. A risk worth taking I think. My socks need perking up..
Well I’m glad you found my blog, I”m not the humorist you are but I do try to lace some of my posts with an underlying humor. Being a teacher myself I think we need to keep our sanity this way. Anyway will be back now and again when I need my ribs cracked. Whoa! Cracked ribs? I’m hoping that’s a reference to food like brisket. I’d rather believe my humor can cook a rack of pork ribs than that it can break human bones. I know my puns are brutally bad, but I never suspected that they are potentially lethal. Lethally racked pork ribs that is, love your humor. From an old wise “cracker” like me. Hello and welcome aboard! Thanks so much for the follow. Hope to hear from you in comments on anything that appeals. I love the interaction and feedback. Have a great weekend. Thank you for the warm welcome. I love writing that is about life in general salted with a bit of humor and wit. I liked the tax-office adventure immensely. I was a public school teacher for 31 years in Texas, the land of cowboys and stupidity, so believe me, I know all about dealing with government and the myopic weasels who run it. I actually write Catch a Falling Star. It was eyeallureblog that nominated me for the challenge. Thank you. And good luck with your challenge too.